Spring is coming…are you ready? We survived. It was one of the snowiest (not sure that’s even a real word?) and most brutal winters on records here in the Midwest. Ice, wind, snow and then more ice. It seemed like storms were coming ever 2-3 days for February and March and we struggled to get to our barns & horses for weeks on end. Winter finally came to an end, leaving us to deal with flooding, mud and general cleanup. While none of that leaves much room for riding it does provide an opportunity to start preparing for the spring and summer months ahead. In fact, this is the perfect time to start “Spring Cleaning” which will allow you to spend a lot more time with your horse, in the weeks ahead. To maximize your time in the saddle in the coming months, we’ve come up with a checklist of 7 things you can do now to prepare for more quality time with your horse, this spring, summer and fall. 1). Inspect & Clean your Leather Tack: Your safety and the safety of your horse depends in large part, on your tack. Check your leather products from top to bottom, looking for signs of mold, excessive wear or excessive dirt. Our friends at the Silver Spur Saddle Shop have a great video on how to remove mold and then clean, inspect and care for your leather saddles, bridles / headstalls, halters, straps, etc.. You can find the first part of that video here…it’s 2 parts so make sure you watch both parts. Reminder: flip your saddle over and inspect it from top to bottom, even taking it apart as needed to insure everything is in tip-top shape. It may look shiny & sparkly from the outside but worn straps, etc., can be a hidden & dangerous ‘surprise’ for both you and your horse. Doing this now will save you time and money in the long-run….it could also save your life. 2). Inspect & Clean your Saddle Pads: Saddle pads that are excessively dirty and worn can cause injury /painful sores for your horse. In addition, it can have a negative impact on how your saddle fits, sits and stays in place. Dirt and dried sweat can build-up and harden, making the saddle pad ‘slip & slide’ and become very uncomfortable and unsafe for you and your horse. 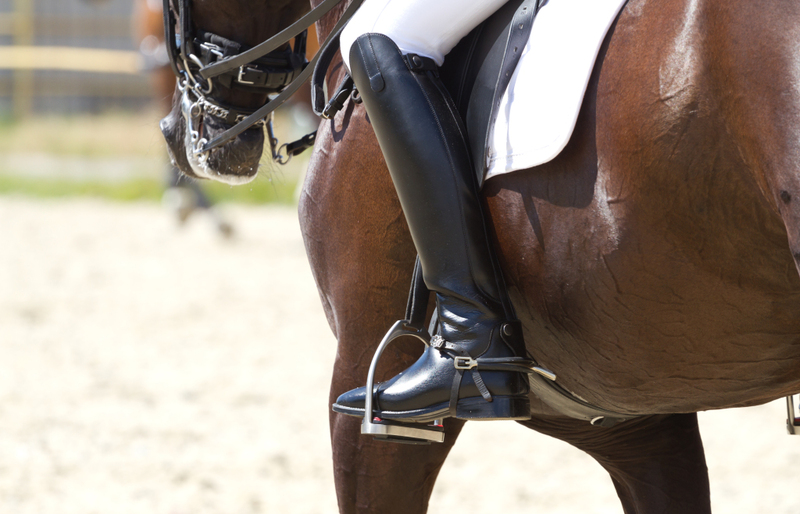 Check with the manufacturer of your saddle pad(s) for specific cleaning instructions. If it’s beyond cleaning, consider replacing it for your safety and the safety and well-being of your horse. Reminder: if your horse is suddenly acting uncomfortable while under saddle, check to insure the tack is clean, fitted properly and not causing pain. 3). Does It Still Fit: Has your horse lost or gained weight during the winter months? Do the nylon / cotton halters that have been exposed to rain, sun, snow and everything in between, still fit? Now is the time to check to insure everything still fits and is safe to use. The halters we use to turn our horses out, hang on a fence and are subjected to extreme heat, rain, snow and cold temps throughout the year. And you know what? After all of that, they tend to not only fade, some shrink as well. Here in the midwest, they’re exposed to everything so we end up replacing our halters especially, every few years. (Recycle and use the smaller halters for other horses in your barn or consider donating them). Don’t forget to check your fly masks, sheets, etc to insure they still fit and are functional. We always use this time to run them through the wash machine as well. If they’re ripped or no longer fasten securely, we replace them. Reminder: it’s not just halters that need to be checked. Check your lead ropes as well. Nothing worse than a horse getting away from you because the cotton lead disintegrates & detaches from that brass hardware you thought would last forever! Water buckets: Use a soft scrub brush and a little bleach and scrub the inside & outside of your water buckets. Make sure you rinse them thoroughly and let them sit in the sun until they’re dry. Water troughs: Get a long-handled soft brush and a little bleach and scrub them, again rinsing thoroughly. Troughs are, in our experience, the toughest things to keep clean from algae and pesky and dangerous mosquito larvae. We try to scrub ours thoroughly, every other week in the summer months. Keeping the mosquito & fly population down is our goal (more on that coming in a later article). We do whatever we can to keep our buckets and troughs filled with cool, clean water and our horses definitely benefit from our extra work. Feed pans & troughs: if the pans are not attached to your stalls, follow the same procedures you do with your water buckets. If they are attached, use a pail of warm soapy water and a sponge and scrub. Follow with a bucket of plain warm water and rinse thoroughly and then dry with an old towel. Stalls: Once a year, we completely strip the bedding out and spray with a product called Tektrol (available from your Vet, Valley Vet, Amazon, etc.) This is used by veterinary clinics and hospitals to disinfect. Follow the manufacturers instructions on how to apply safely. This product does a great job of killing lurking viruses, bacteria, etc.. Inspect all the hardware in your stalls to insure it’s not broken or damaged and replace things that can be a hazard to your horse. It’s amazing how destructive/mischievous horses can be in their stalls. No one wants their horse to inadvertently ingest anything dangerous, like broken bolts, straps and yes, even twine. If your horses live outside, 24 x 7, check to insure your fences are intact (no broken or missing boards, etc.) and working (if electric). Walk your pastures to insure nothing ‘sinister’ has appeared (ie debris blown in from places unknown) that could cause issues for your horse(s). Reminder: Fences not only keep your horses IN, they are also instrumental in keeping predators out. A secure fence is crucial by all accounts. 5). Reducing Allergies: Spring & summer are prime months for allergies…and I’m not just talking about our human allergies. Horses can have or develop allergies as well. Every spring, summer and fall, we do our best to take ad old rag or towel and dust our metal stall fronts. Taking a broom and knocking down *spider webs can also reduce the amount of dust in your barn and arena which is beneficial for you and your horse. Let’s face it…we’re working in barns/stables so it’s impossible to eliminate dust and other allergens but a little extra work can help reduce them and make your time with your horse, more enjoyable. If your horse has allergies OR you suspect he/she might, consult your veterinarian for possible medications that can provide relief. Reminder: We keep our halls swept, clear and watered as well during the spring & summer. Not only does it help reduce some of the dust for our allergy sufferers, it insures there is nothing for us, our visitors and or horses to inadvertently trip or slide on. Safety FIRST. 6). Horse Health: Spring is when our Vet comes out and does shots, worms our horses and checks their teeth. There are a lot of concerning equine-related viruses making the rounds this year and even though we are not a boarding facility and we no longer take our horses to shows, we make sure our horses are always up-to-date on their shots. In addition, we have our horses teeth checked to make sure no dentistry work needs to be done. (If you horse is dropping grain and/or weight…it’s time to schedule a visit with your Vet for a full exam). We also review nutrition/feed, overall horse health questions at our spring visit. Reminder: This visit will also give your Vet a good baseline for your horses overall health and wellness. 7). And finally…check YOUR helmets and boots! Cracked or broken helmets offer no protection and are not safe so toss them out and replace them as needed. The same philosophy applies to your boots…if they are cracked or the sole is loose, it’s time to replace them. No one wants to get a portion of loose sole caught in a stirrup or trip while you’re moving your horse. Reminder: Your time with your horse is just as important to him/her as it is to you. It’s hard to spend quality time with your horse if either of you are injured so safety first! These are just a few simple tips to get your spring and summer off to a safe, healthy start. Spending a little extra time doing these things now will allow you to have extra time in the saddle with your horse in the months ahead. After all, that’s what this all about…more time with your horse!